"Shine through my scars, Morning Star! Lord Of Pagathorn roared out from its lifeless crypt and made a record deal with Woodcut Records. The deal consists of two full length albums. Recordings and invocations for the first full length album are planned to start under the waning crescent Moon in the year of the Devil 2012. 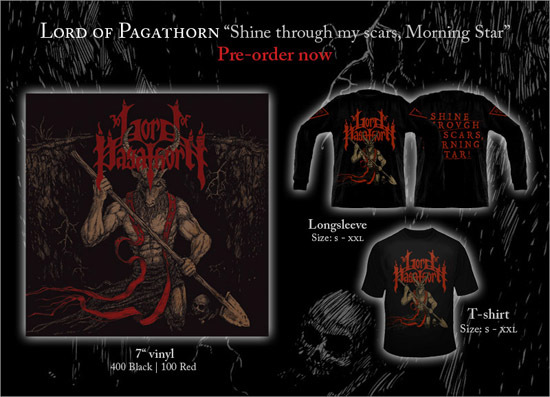 Before the recording work for the first full length, Lord Of Pagathorn has now attacked the studio and recorded one new song and one cover song for "Shine through my scars, Morning Star!" 7" vinyl which will be released by Woodcut Records. These new songs are not to be presented on "Nekros Philia" full length.